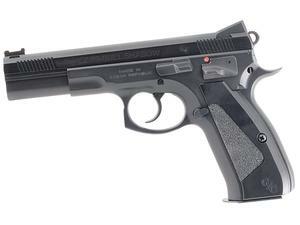 The CZ 75 Bull Shadow built by CZ Custom combines the advantages of a bull barrel with CZ 75 ergonomics. The Bull Shadow offers low recoil shots, fast sight recovery, fast target transitions with easy to use controls. The Bull Shadow is built off a USA made slide and bull barrel. Features a 4.925" barrel, full length stainless guide rod, Combat/Fiber Optic Sights and thin aluminum grips.